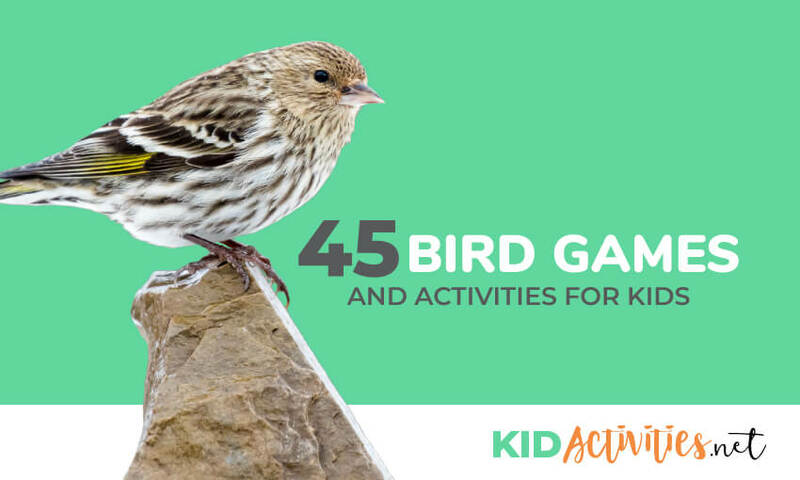 If you are looking for some fun bird games and activities for kids, look no further. Here you will find an extensive list of bird themed activities. Below are many ideas to add to a Spring, Winter, Nature, Earth Day, and BIRD THEME… It doesn’t matter what time of year it is—-the birds can always use a friendly hand. Below you’ll find suggestions for nest building, bird houses, crafts, science, snacks and more! Kids love working with feathers! Print out or draw a picture of a bird onto construction paper. Paint the back side of a paper plate any color you want and let dry. Cut feather shapes out of various colors of construction paper. Cut a circle out of black construction paper for an eye and an orange triangle for a beak. Mix flour, salt & birdseed with sufficient water to make play dough texture. Note: This activity is included because it contains “bird seed” and fun to the theme. Do not place outdoors when done playing–as salt is dangerous to birds. It can make them ill–or kill them if consumed in large quantity. Have children apply glue and then bird seed to the picture or paper in design of choice. For interest, use a variety of bird, sunflower, corn kernels, etc. Paint egg cup or styrofoam ball. Let dry. Glue the pom pom or styrofoam ball onto the top of the egg cup. Glue feathers onto the back of the egg cup. Glue two wiggly eyes onto the pom pom or styrofoam ball. Cut a one-1/2 inch piece of pipe cleaner and bend it in half. Glue this onto the bird’s head for an open beak. Done!!! Glue one or two feathers to the back of the pinecone near the bottom. Glue two wiggly eyes on the other side of the pinecone near the top. Cut a one-1/2 inch piece of pipe cleaner, bend in half and glue on beneath the wiggly eyes. An easy and inexpensive bird! Put out an assortment of feathers, paper and paint. Have children experiment with a variety of paint textures and feathers for their own unique piece of “Feather Art“. 8. MAKE A SHREDDED WHEAT BIRD NEST! 1. Line the bowl with glue and into crumble several large pieces of shredded wheat cereal. 2.The shredded cereal should stick to the glueon the sides of the bowl and resemble a bird nest. 1. Cut off the top 3/4 of a paper lunch bag. 2. Scrunch bottom of bag down a bit. 3. Fill with artificial grass, moss or cut up pieces of paper, or green or brown colored streamers. 4. With the remaining 3/4 of the lunch bag that was cut off, cut horizontally across the lunch bag and strips will remain circular and intact, and ready and easy to wrap around nest. 5. Arrange the strips around the outside of the nest. Place plastic eggs, chick, or jelly beans in the nest! Find pinecones that are flat enough to stand upright or snip off a small amount from the bottom so that it is flat enough to stand the cone on end. Cut out circles from the brown felt or foam. The circles should be a little larger than the size of your googly eyes. Glue the googly eyes onto the circles. Cut out triangle shaped ears from the brown felt or foam and triangle shaped beaks from the yellow felt or foam. Glue the eyes, ears and beaks onto the pinecones. Discuss penguins and follow that by putting out supplies. Glue the Easter Grass onto the coffee filter; fill with jelly beans! Bird feeding isn’t just a winter activity; it might surprise you to learn that even in spring, food is still scarce for our feathered friends. The temperatures are usually cool enough that many insect populations haven’t emerged, and that’s sad news for those birds that eat insects. Also, the fruit eating birds won’t see their favorite foods naturally appearing until harvest! You don’t need to buy fancy bird feeders to feed your backyard friends. Wrap each ball in netting from onion bags, and secure with a plastic twist. This recipe makes about 12 feeders. Punch holes on either side of a plastic pop bottle. Stick a twig all the way through with its ends sticking out for perches; poke more holes nearby for the birds to pull the seeds out. Hang the bottle by tying a string around its neck. 1. Tie a piece of string around the widest part of the cone. 2. Mix the lard and seed together. 3. Press the mixture into the branches of the cone. 4. Use the string to tie the cone up in a tree pr bush for the birds to enjoy. Tie a string around the neck of a baby food jar and fill with orange juice. Hang it from a tree. (It will hang tilted, but Orioles will perch on the rim and take dainty sips). They also love oranges! 17. BIRD FEEDER #5 Stick a piece of bread, a donut, half of an orange–or a cherrio wreath (such as sample photo to the left) on a twiggy branch of a tree. This bird feeder won’t last long, but it is so easy to make, you can always have another one made all ready to replace it when it wears out! 1. Wash and thoroughly dry the milk carton. 2. Cut a small section from the carton and then staple the top opening closed. 5. Add birdseed and hang the feeder. (Since the small milk carton feeders are just the right size for the tiny birds such as finches, wrens, etc., you might want to use thistle seed. It is the finch’s favorite food! Garden supply stores carry a sterile thistle seed just for bird feeding which is guaranteed not to sprout all over the yard). Using a simple egg carton, you can help our feathered friends. Remove the lid and save for another use (to hold paints like a palate for example). Fill the carton sections with birdseed. Poke holes in the 4 corners of the carton and attach a string to each. Next gather the strings together at the center, knot, and hang the feeder outside. Spread the lard on the bagel. Tie ribbon or string through the hole of the bagel to hang the bagel. One of the good things about this bird feeder is that the birds can eat the whole thing! Spread the peanut butter or honey onto the entire bagel. Roll the bagel in the birdseed. Most of the bagel should now be covered in birdseed. Have the children tie the ribbon through the hole of the bagel. Hang the birdfeeder from a tree in their yard when they go home. 21. SCATTER BREADCRUMBS ON THE GROUND! Supplies: Flat wooden shape (such as a heart), peanut butter, birdseed, drill, 4 feet of 1/4 inch wide ribbon, one bowl. 1. Drill a small hole in each side of the shape – the same distance from the top so that the shape does not hang lopsided. 2. Cover the wooden shape completely in peanut butter and then place the heart in a bowl of bird seed. 3. Cover the entire area of the shape with the birdseed making sure no empty spots are left anywhere on the shape. 4. Cut two lengths of ribbon each 2 feet long and run one length of ribbon through each hole. 5. Tie all ends of the ribbons together in a bow or knot. 6. Hang heart shaped bird snack in a tree or somewhere birds have easy access to it. 1. Use a corn cob as a base. 2. Completely cover the corn cob with peanut Butter. 24. DECORATE YOUR TREES OR SMALL SHRUBS! Take STALE BREAD and have children cut shapes with COOKIE CUTTERS. Have them spread peanut butter on the bread with a plastic knife and then sprinkle on birdseed. Poke a hole at the top with a plastic straw. Thread with raffia or yarn. Together decorate the outdoor bushes and low trees branches with these “yummy” decorations. CHEERIO CHAINS…Wrap tape on one end of a long length of yarn. Tie a knot with a Cheerio on it at the other end. Demonstrate how to string the chain by sliding a Cheerio (or any “O” shaped cereal) over the tape (needle) and dropping it to the bottom. Invite children to help you until the entire chain is strung. Drape these chains around outside tree for birds/animals to enjoy. Poke a hole with a plastic straw at the top of each orange slice. Thread with raffia or ribbon and tie each slice to a branch. Mix everything together (this will be nice and messy!). Place the balls in a bird feeder and watch your feathered friends enjoy their snack. . Birds, squirrels and other small wildlife are in constant search of food, fresh water and safe shelter. 1. Find a stick that’s between 1 and 5 centimeters in diameter (2/5 inches to 2 inches). You can leave it in the refrigerator to harden or just hang it on your bird’s cage or outside branch. 28. FEED THE BIRDS WITH APPLES AND BIRD SEED! 1. Take an apple and cut it in half. 2. Put peanut butter and bird seed on it. 3. Place or hang it from trees and watch the birds. (As this photo illustrates, you can also find a safe area and slice an apple and place it in a dish with peanut butter! 2. String Cheerios on the pipe cleaner until it is full. Add chow mein noodles to melted morsels and mix. Shape into a circle on wax paper. Use a large spoon to make indention in center. Add jelly beans or chocolate eggs. 31. MAKE A REAL BIRD NEST! After showing children pictures of bird nests (Or a REAL bird nest kept in your science center) provide them with mud, sticks, grass, leaves, twigs, pine needles, and pebbles. Place a hardboiled egg in water. The egg will sink. Challenge the children to tell you what they think will happen when you add salt to the water. Add salt…Once you stir in enough salt the egg will float. FYI: WHAT IS AN OWL PELLET? Like many birds, owls don’t have teeth, so they swallow their food whole (or in parts). A pellet, in ornithology, is the mass of undigested parts of a bird’s food that some bird species occasionally regurgitate. 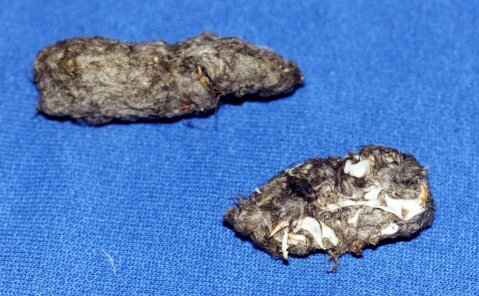 The contents of a bird’s pellet depend on its diet, but can include the exoskeletons of insects, indigestable plant matter, bones, fur, feathers, bills, claws, and teeth. The passing of pellets allows a bird to remove indigestable material from its glandular stomach. In birds of prey, the regurgitation of pellets serves the bird’s health in another way, by “scouring” parts of the digestive tract, including the gullet. Pellets are formed within six to ten hours of a meal in the bird’s gizzard (muscular stomach). 1. Google ‘Owl Pellets’ into your search engine–they can be purchased online at many stores. 2. Place pellets into a glass jar in the science center. For older youth — consider dissecting the pellets to see what they will find! 1. Combine the ingredients in a large bowl. Stir together. 2. Drop the mixture into muffin tins, pressing it down with your fingers. 3. To create a hole for hanging, push a stick or dowel down in the middle. LET DRY. 4. Remove from the pan & take out the sticks. Thread yarn or string through the hole. Tie a loop and hang from a tree for the birds to enjoy. 35. FRY AN EGG ON THE SIDEWALK! Set up a bird feeder, bird bath and bird house where you and the children will be able to quietly observe. They’ll enjoy watching different animals seek the food and water… and your bird house will be there when needed. 37. HELP THE BIRDS BUILD THEIR NESTS! Can the children hear the differences? After listening a few times-can children identify the bird by their sounds? To go along with this…collect bird books. Talk about names, colors, where they live what part of the country or world, etc. This is the way we scratch for worms, scratch for worms, scratch for worms. This is the way we scratch for worms so early in the morning. This is the way we peck our food, peck our food, peck our food. This is the way we peck our food so early in the morning. This is the way we sit on our eggs, sit on our eggs, sit on our eggs. This is the way we sit on our eggs so early in the morning. This is the way we flap our wings so early in the morning. This is the way we fly away so early in the morning. 1. Using medium size kick ball size balls–have children place a ball between their legs and race to a point. Some of the best bird watching is in your own back yard. Many colorful birds are there to see every day. It’s easy to learn the birds that live around you. YOU’LL ONLY NEED TWO THINGS to start watching birds…A BOOK AND BINOCULARS! BINOCULARS let you see the birds up close. They let you see details of undersides and wings when the birds glide overhead. A BOOK IS YOUR ‘FIELD GUIDE’ and will help you learn the birds’ names. It’s like having an expert by your side so you’ll know what you’re seeing. 2. Backyard Bird Walk by Jane Kirkland… A great resource for parents and teachers who want to bird with kids. It teaches youth how to find and observe birds’ nests without harming them. It shows how to tell what a bird eats by looking at its bill and tells how to help an injured bird. HAVE YOU FOUND A BABY BIRD? 1. Do not pick up the bird unless you are VERY sure it needs help. Sometimes, the mother will leave her baby alone for a specific reason. She could be watching from a nearby tree or burrow, getting food, or chasing away a predator, or playing decoy to one. 2. Do not remove the animal or bird from its den or nest UNLESS you KNOW the parents are dead. Only then should you consider becoming a foster-parent. 3. If a young bird has fallen out of its nest, PUT IT BACK. 4. The old saying that birds will abandon their chicks if humans have touched them is not true. Birds have a very poor sense of smell, so you may safely place the baby in its nest. Remember, though, that the mother may have pushed the baby out. She could be teaching it to fly. 1. If you have eggs, leave them alone. It is illegal to possess wild bird eggs. The parent birds will usually re-nest and start over. 2. If the chick is partially hatched, or hatched but has no feathers yet, put it in the nest. If you either can’t see or reach the nest, you may put the baby in a plastic berry basket lined with paper towels to form a cup that you have placed securely on the trunk of the same tree. 3. If the baby is completely covered with feathers, chances are it is supposed to be out of the nest. You can place it on the top of a shrub away from predators. 6. Wait and watch, first, to see what animal is using the nest site. 7. If the nest itself has fallen out of the tree, you can often put it back. Again, use a berry basket or a small square of screening as a base, and tie the nest to a limb. But don’t use an old nest as a frame, because it could have mites or bacteria which could contaminate the newer nest. 8. If the baby is obviously in need of medical treatment, call a veterinarian or animal-rescue center. Basic first aid for bleeding and other emergencies is okay, but do not attempt to feed baby birds or give them water. They could choke. 9. While you’re waiting for help, keep it warm and dry. You can use a heating pad on low setting, or a sealed jar of warm water, or a hot-water bottle. 10. Keep a towel between the animal and the heat source. Keep it out of direct sunlight. Baby animals, especially birds, can overheat quickly. 11. Release the animal when it has recovered. Try not to turn your patient into a pet. Wild animals belong in the wild. They are unpredictable, and find it hard to adapt to our ways. Furthermore, it is ILLEGAL to raise young birds and some animal species. 11. Finally, you should understand that despite your best efforts, some animals will die. That is also part of Nature’s ways. Information is provided by the Oklahoma Department of Wildlife Conservation and the National Wildlife Federation. FOUND THIS GREAT FEBRUARY BIRD IDEA! The Great Backyard Bird Count (or GBBC) is an event that takes place over four days in February each year. It’s very easy! All you have to do is watch birds in your yard, a nearby park, or maybe at your school. Then you tell what you saw by entering your bird list online. They collect that information from people all over the United States and Canada SO SCIENTISTS CAN LEARN WHAT KIND OF BIRDS ARE BEING SEEN IN THE WINTER AND WHETHER THERE ARE MORE OR FEWER THAN BEFORE! Click here – to learn more about how to participate. February is also Wild Bird Feeding Month!